Pope Francis delivers the Urbi et Orbi (to the city and to the world) blessing at the end of the Easter Sunday Mass in St. Peter's Square at the Vatican, Apr. 1, 2018. 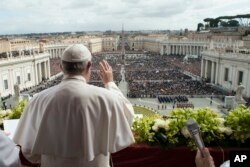 In his Easter message, Pope Francis called for peace in a world marked by war and conflict. Addressing tens of thousands of pilgrims gathered in Saint Peter’s Square from the central balcony of the basilica, the pope called for an end to "carnage" in the long-suffering land of Syria and "reconciliation" in the Middle East. Francis’ appeal for peace came in his Urbi et Orbi message after having celebrated Easter mass in Saint Peter’s Basilica. He said the message of the resurrection offers hope in a world "marked by so many acts of injustice and violence”. The pope begged for peace for "the entire world, beginning with the beloved and long-suffering land of Syria, whose people are worn down by an apparently endless war." "This Easter,” the pope said, “may the light of the risen Christ illuminate the consciences of all political and military leaders, so that a swift end may be brought to the carnage”. Francis demanded that aid be delivered to the needy in the war-torn country and called for "fitting conditions for the return of the displaced." Pope Francis acknowledges pilgrims while delivering the Urbi et Orbi blessing at the end of the Easter Sunday Mass in St. Peter's Square at the Vatican, April 1, 2018. The pope also urged reconciliation in Israel, a place "experiencing in these days the wounds of ongoing conflict that do not spare the defenseless." His words followed the Friday deaths of 15 Palestinian protesters on the Israeli-Gaza border two days before Easter Sunday. Turning his thoughts to Africa, the pope also called for peace in South Sudan and the Democratic Republic of Congo. The world’s first Latin American pope also urged international assistance for Venezuela, so that more people would not have to abandon their homeland because of the economic and political crisis. Finally, Francis also expressed the hope that the "fruits of dialogue" would advance peace and harmony on the Korean peninsula, where the two sides are set to hold their first summit in more than a decade on April 27. This year, Eastern Orthodox Churches, which include Jewish Passover in their calculation of Easter dates, celebrate the holiday next Sunday, April 8.